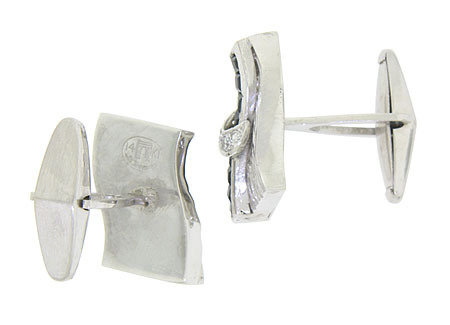 These fantastic estate cuff links are fashioned into wide, curving ribbons of 14K white gold. Strings of square cut sapphires stretch across the surface in a deep angle. 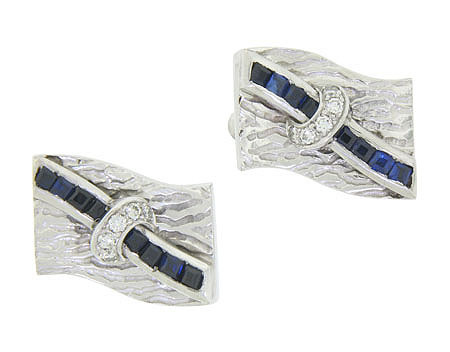 Elevated crescent figurals set with fine faceted diamonds drape over the deep blue sapphires. The surface of these handsome cuff links is engraved with an abstract tree bark pattern. The cuff links measure 3/4" long, 1/2" wide. Circa: 1950.